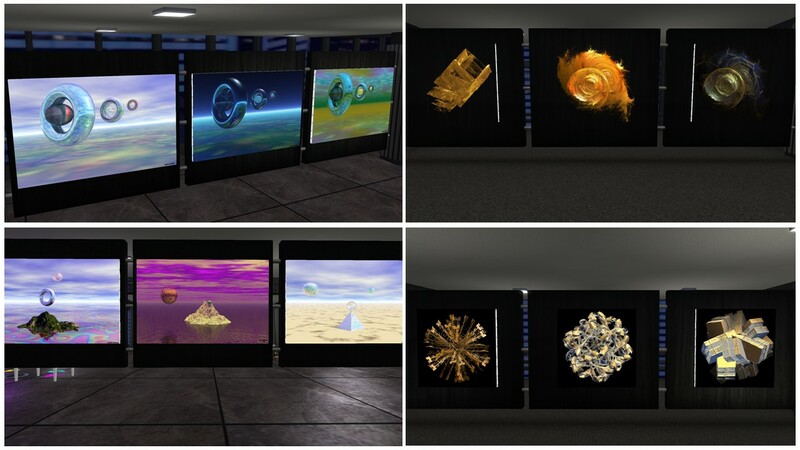 In July I visited the exhibition “Dreams in Space Fractals” by Barry Richez at R&D Gallery in Diomita (read here). Now Barry Richez has opened his own gallery, the “Alphalune Creations Gallerie” of paintings and sculptures and he invited me over to see it. Barry Richez is a French artist. In Real Life he creates sculptures made of raku (Raku is a type of Japanese pottery) and digital paintings. 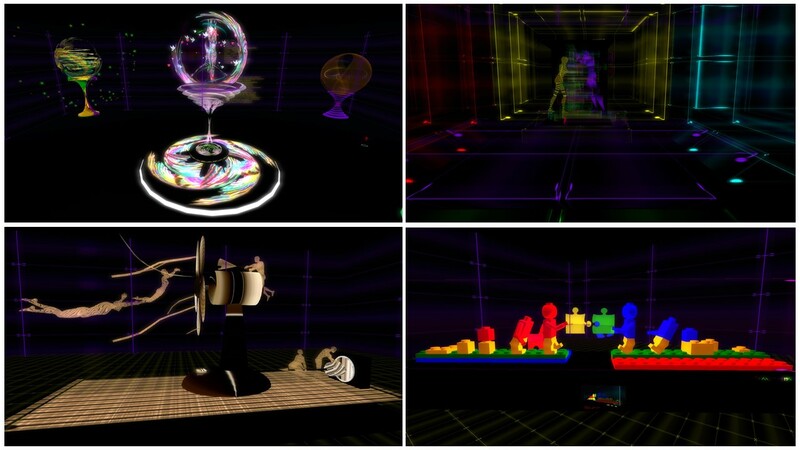 In Second Life he started 2008 with some digital paintings and simple sculptures. When he progressed to more complex sculptures and fractals he participated at different contests, especially at the University of Australia in second life (UWA). Barry Richez won several prices, has created sims within the LEA program and had numerous exhibitions – and has an own gallery now. The “Alphalune Creations Gallerie” is divided in 2 parts, one is dedicated to Barry’s sculptures and one to his digital paintings and fractals. Each part has it’s own highrise building. The landmark leads to a court between the two buildings, where Barry placed a big award winning sculpture made in 2011 and named “Electroman”. It is recommended to set your viewer to “midnight” in order to get the right impression of the art. I first visited the part with the sculptures. There are 5 levels and you travel between them with teleporters. The sculptures have enough room to unfold their effects. On the gound level you find the sculpture “Quantum” from 2013 as well as two scuptures that allow you to become part of it, “Imagination” and “Freedom”. On level 2 I found the the scuplture “Peace and Love” that was also exhibited at the R&D gallery, the whole level 4 is occupied by the installation “Love impossible” and level 5 is dominated by the scupltures “Body Fan” and “Transformations”. Barry Richez’s sculptures are outstanding, they impress as single, alone standing objects. They look different from every viewing angle and depending on light. And you can discover new details every time you look at them. The whole sculpture part of the gallery impressed me a lot. You can also purchase most of the sculptures if you have enough space and prim allowance to rezz them at your own place. In the second high rise building you find Barry’s digital paintings. They are arranged by themes on several levels, that are connected by a central staircase. And you can also purchase them.